Aroma Thyme Bistro is proud to serve Sprout Creek Cheese. The Creamery is where the magic happens: where milk becomes cheese. We make our cheese from the rich and creamy milk of our herd of grass-fed Jersey, Milking Shorthorn, Normande and Holstein cows and our Nubian, Toggenburg and OBerhasli goats. These artisanal cheeses are made in the age-old tradition of European farmstead cheese, using a method that enhances the innate qualities of the milk. From season to season, you can actually taste subtle differences as the pasture grasses change with fluctuating temperatures and amounts of rainfall. The main ingredient used in the cheese making process is milk. Many types of cheese in North America are made from cow, sheep or goat milk. There are other varieties of milk used, however. The milk of a buffalo, for example, is used to produce Mozzarella cheese. 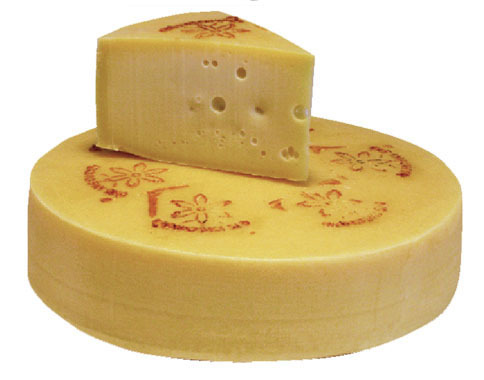 Milk from deer, camel, horses, llamas, and yaks are all used to yield different varieties of cheese and cheese blends. 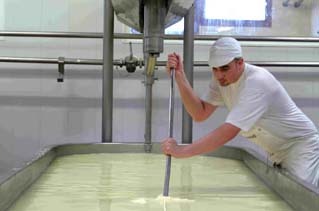 Coagulating or curdling the milk until it turns into curds and whey is the first step taken when making cheese. Today, cheese is curdled with a bacteria culture and a coagulating enzyme, both of which help to speed the separation of liquids and solids. The curdling process begins by warming the milk until it reaches a bacteria-free temperature. During the warming period, a coloring dye is sometimes added to produce a particular color in the finished product. Once the milk has reached a consistent temperature, the starter culture is added and the milk begins to coagulate into one large curd. Other succeeding processes involve removing the whey, molding and shaping, salting process, and ripening. The aging process is perhaps the most important part of the art and science of cheese making; it is what delivers the milky conversion of soils and grasses to your palate and creates the distinct flavors and textures in the cheese. Cultured milk is cut into curds using cheese harps; the curds are gently stirred as they’re heated to express whey, and placed into molds. Each cheese is then placed in a climate-controlled room for anywhere from 3 weeks to 18 months to ripen. In harmony with the earth’s natural cycles, the goal of grass-based production is to provide our animals with their ideal eating habitat. We rotate our cows and goats through our pastures from March through November, thus maximizing their ability to do what they do naturally: forage. This is better for the animals, easier on the land, and healthier for us who drink their milk and eat their meat and cheese. Pasture-raised animal products have less harmful fats, cholesterol, and calories than grain-based ones. They have more antioxidants, high levels of the beneficial omega-3 fatty acids, and more of the cancer-fighting fat, CLA. A pasture raised system also means less tractor work, less fuel consumption, and no herbicides or pesticides.